Curious how our services would work for your company, products and specification goals? Below are some frequently asked questions which may help answer some of the common thoughts that come to mind when learning about our architectural specification services. For more specific answers to your questions, please fill out the form to the right below and one of our team members will contact you shortly. Why should I hire RBA to make specification calls instead of hiring someone to directly work for our company? RBA has access to "hard to see" architectural firms and spec writers because they know us. They see us because we will not waste their time when we are educating them about your product technology. We can help you establish better communications with design professionals and spec writers with whom you are having difficulty. Many times architects are reluctant to tell product reps about problems, but they will tell us. We can find out what the problems are and how they can be corrected. RBA saves your staff and reps valuable time by calling on design professionals, so they can be selling in the field. Are your reps paid to call on architects or to move product? Are they evaluated on the number of architects they visit? Reps are busy solving field problems, calling on customers and putting together bids. Often they are unable to find the needed time to call on the design professionals in their territory. Hiring a full time rep to make architectural specification calls is very expensive due to salary, benefits, and travel expenses. Our specification program lowers your personnel costs. Current estimates are that the average direct company rep costs the company $90,000 to $100,000 per year. Do you really want to add another company rep to your payroll to concentrate on design professionals? We identify your local rep or distributor in the area to the design professional. Your representative will get the results of our face-to-face meetings and can make follow-up calls, as requested by the design professionals. What is the most important aspect of the Architectural Specification Program? Follow up! Once our representatives begin making architectural specification presentations to design professionals, there needs to be a point person in your office to perform the follow up. Follow up might be as simple as sending product literature or guide specs. "Hot leads" and weekly call reports are emailed to your company every week. A spec writer will not wait long to receive help from a manufacturer. Therefore, someone on your staff must be able to quickly respond to guide spec and product literature requests, technical and pricing questions, and anything else that the design professional asks for. The point person might also send the “hot leads” to reps in the field to follow up on. This helps establish a relationship between your company and the design professional after our initial visit. What do RBA’s representatives do when they visit a design professional’s office? How much does the Architectural Specification Program cost? RBA is paid no commissions. We work on a monthly retainer basis. This fee includes our representatives salary, travel expenses (airfare, hotel, rental car, etc. ), and all administrative costs. There are no hidden fees. We have several programs to fit your company’s budget. We can create a national program for you to maximize the 50+ markets that we visit or we can develop a regional program. 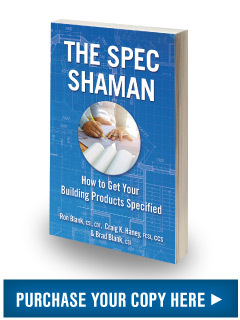 How do I determine the success of the architectural specifications program? The success of the program can be determined by three criteria: company and product recognition, education, and specification. Our representatives have three goals when they walk into a design professional’s office. First, we build name recognition for your company and product line. After our initial visit, your reps and marketing team should feel confident that the design professional recognizes your brand and is aware of your company. During our presentation, our representatives will educate the design professional about the basic benefits of your product. Educating the design professional is crucial in getting your product specified. Finally, we ask that the design professional include your product’s in their office master specifications. "Hot leads" are emailed daily to your company. A spec writer will not wait long to receive help from a manufacturer. RBA’s communications will inform you who to contact and what urgent requests are concerning. Often, this occurs when a spec is being finalized and we have an excellent chance to get your products in the specification. Reports are written for all calls we make and are submitted to you at the end of each call period. You can then send these call reports to the appropriate rep or distributor for sales follow up.